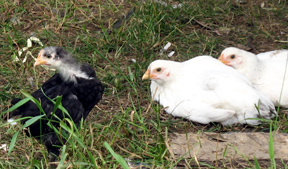 Many breeds are considered homestead breeds, meaning they are dual purpose birds-good for both meat and eggs. An important consideration on the homestead is a bird that is strong, hardy, requires minimal care, and will raise their own chicks. The birds to fit this bill are many of the heritage breeds. Meaning they are one of the first breeds introduced here in the US. Incidental many of these Heritage Breeds are also on the endangered or critical list. They are worth taking note of and ensuring their survival for many years to come. These homestead breeds are a hardy stock and most have no trouble over the winter with just clean, dry, draft free shelter to live in. Are also good foragers and some prefer to forage their own food over gain feed. You can find them at local chicken swaps, from breeders, and hatcheries. 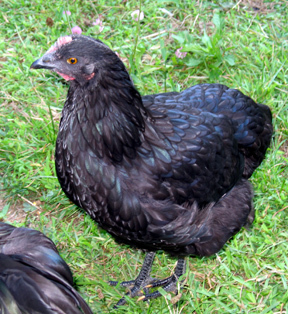 There is also a yahoo group for rare breeds of chickens, and a yahoo group for Java chickens. Chickens need clean, dry and draft free shelter. This can be anything from special built coops to a corner in the the garage or barn. They also need a place where they can feel safe to relax and lay their eggs. They enjoy nest boxes to settle down in to lay their eggs or if they have gone broody to hatch out their eggs. Usually one box for 4-5 chickens is enough. Chickens like to roost at night, meaning they like to be up off the ground and if you provide roosting places for them this is where you will find them in the morning. Most people build their chickens a safe secure house and provide them with a fenced in run to exercises during the day. Some just let their chickens out to roam around the yard free and close them up for the night. One word about this, if your chickens run free in the day they will scratch, dig and nibble everything in site! They have no problem trying a bite from every growing flower or veggie in the garden or even digging them up. If your chickens are going to run the yard, you will need fencing around your garden and flowers. If you live in an area with lots of neighbors or heavy traffic this probably isn’t the way to go. There are movable houses called chicken tractors that allow the run and house to be moved where needed to fresh grass for them. Most are on wheels or skids. A quick search on the internet for chicken housing or chicken tractors will give you some great ideas on what to build. Your coop will need to be cleaned out often, here I clean mine daily. I use sawdust on the floor and shredded newspaper in the nesting boxes. I use a manure fork to sift through it daily. This will keep the smell and flies down. Some use the deep litter method, in that they will add a thick layer of either shavings, straw or newspaper and just keep adding more to the top to keep things clean. Then do an entire clean out about twice a year. Either way works but I prefer daily cleaning. Chickens will eat what ever they can forage with no troubles. They will need some chicken feed, either mash or crumbles. 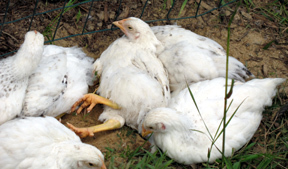 Young chicks require a high protein diet around 24%. My very young chicks I mix their chick feed with water to make sort of an oatmeal for them. I also will give them yogurt, cooked scrambled eggs, and milk. This gives them a good start to life and grow well. As they get older around 6 weeks you can switch them to 20% grower and then to layer pellets or mash. At laying age they will also require grit if they don’t free range and oyster shell for calcium. Saved eggs also can be used. To do this simply rinse out your egg shells, remove the inside membrane and let dry. Once dry crush fine and add to their scratch mix. 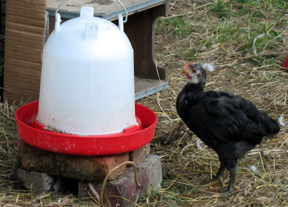 Chickens need to have access to clean food and especially clean water at all times. Their waters should be rinsed out daily and scrubbed down once a week at the least. Raising their waterer up off the ground will help a great deal with dirt, grass and other stuff getting into them as fast. Some have told me that their chickens only have access to food and water during the day and don’t keep it in their coops. To me this isn’t a good thing. I have seen some birds because of their pecking order kept from food and water during the day leaving them their only opportunity to eat and drink at night while the others are sleeping. It may keep the coop cleaner to keep food and water out of it but I don’t think it’s best for the birds. In addition to their daily feed offer your birds at a young age a variety of foods from the garden and your table. They will eat a wide variety of food. Each has their own favorites and it’s best to offer them the choice while young, as they get older they will stick with what they know and not want to try something new. Sprouting grains are a good source of additional nutrition, as is milk and cheese. Some insist on mixing their own organic grains to feed their birds, while this is an option if yours can free range at least a few hours a day. I find that the grain manufacturers have their nutrition all figured out an if your not careful mixing your own grains your birds won’t have the nutrition they need to stay healthy. While it’s true the manufactured grains all have useless fillers and who knows what else added, looking for an organic feed will solve this problem. One note on mixing your own or even organic is more than double the price of the mill grain. This is something you will need to decide. Here I feel the organic grain I give the birds is not even 1/2 their diets so to me it seems okay. We are fortunate that we live in a town with no regulations on keeping animals as we live in an agricultural area. Before getting chickens or other animals you should check with your town to check if there are regulations in your area. I have been told some cities will allow hens but not roosters, or also a limited number of chickens or that they must not be in sight of the road or neighbors. That will depend on the amount of space you have and how fast you will use their eggs. A hen will lay an egg about every other day. Each chicken requires enough space to be clean and healthy. Some will say 1 square foot per bird. I personally like to be sure mine have at least 2 square feet and more is better while penned up. There is no reason I can see not to have a rooster around. They provide protection as they are great “watch dogs”. Mine let me know when anything is in the yard that isn’t supposed to be including the mail lady. They are a natural part of a flock but your hens will be fine if you don’t have a rooster. Oh’ yes they do make noise all day long and this is something to consider as well. Homestead birds usually are a dual purpose bird meaning they are for both eggs and meat. Hens will start to slow down on their egg laying at about 3 years old when this happens they make their way to their next purpose of providing meat for the table. Extra roosters and non breeding quality birds will make their way to the table as soon as they reach full weight for that breed of bird, usually around 9 pounds for the roosters and 7 pounds for the hens. 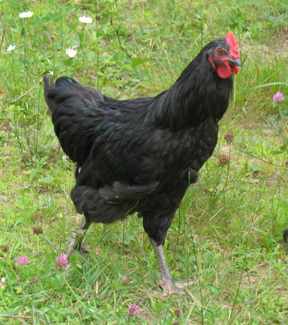 Heritage breeds are great broody hens, meaning they want to raise chicks. They are often used as foster parents for the fussy newer breeds that the broodiness has been breed out of. This behavior is ok, and the hens will find a quiet dark corner to sit on their eggs. If you want them to hatch chicks, (providing you have a rooster, you can not have chicks without a rooster.) just let them be. If not simply gently put your hand under them and collect their eggs daily. It’s ok to let them sit a couple of weeks and usually they will stop this behavior on their own. If not you will need to block their access to the nesting boxes, but often they will simply find another dark out of the way corner and continue to sit. Chickens if kept clean and healthy will live about 7-8 years. As they get older they will lay eggs less and less and eventually stop laying. A hen will usually lay an egg every other day or so, or about 5 a week. Eggs should be collected in the morning and wiped clean with a cloth. Don’t wash the eggs as this will remove the protective coating on them and they will go bad quickly. Should you have one that is extra dirty go ahead and wash it but use it right up. Eggs should be stored in the fridge in a covered container. Although I know many who keep them in a basket on the counter, keep in mind that these eggs will be used within 2 day at the most. If you want to keep them longer put them in the fridge. A young hen will start to lay around 5-7 months old and the eggs will be small to start with. They may also have double yolks or a soft shell. They will get larger and stronger shells as the hen gets older. If your hens free range all the time it might be hard to find their eggs as they like to lay them in safe out of the way places, don’t use an egg if you don’t know how old it is. Even if they are penned be sure to check any hiding places daily for hidden eggs, who know you would be on an egg hunt every day? I have been asked the question what to do with the eggs that you know are fertile eggs but don’t want them to be hatched out. My answer is simple, collect them every morning and do what you normally would with them. Eggs fertile or not are fine to eat and bake with. Predators are a natural part of a chicken’s life. Sad but true. Around here that is bear, fox, coyote, weasel, hawks, raccoons. But that doesn’t rule out your neighbors or even your own dog or cat. They are going to need good protection in the form of secure fencing and housing. Here I need to run an electric tape (fencing) about a food off the ground around the coop. This is about the only thing that will stop a bear. Wire for their run needs to be strong and buried a foot or so in the ground. Chicken wire isn’t going to keep anything out of your pen. It’s made to keep the birds in but not anything out, it just isn’t strong enough. Burring the wire will help with animals who think they are going do dig down under the fence. You will also need fencing across the top of the pen, well because some of them like weasels and raccoons can climb well. But you may live in an area where this won’t be a problem you will have to watch and decide for yourself. The smell of chickens will bring all these lovely animals out of the woods pretty quickly so you will know soon. American Livestock Breed Conservancy A great place to read about the heritage breeds and the endangered here in the US. Back Yard Chickens A great group of chicken crazy folks! Everything you ever wanted to know about chickens and many great resources, advise and a few laughs. The Modern Homestead, Poultry in the Homestead lots of great information here from feed, housing, raising food and much more. Worth a visit. North Dakota Extension Service Some coop plans large and small. Also feeders, egg racks and nesting boxes. Posted on August 18, 2009, in Chickens, Homesteading and tagged Delaware chickens, heritage breed chickens, homestead chickens, Java chickens. Bookmark the permalink. 4 Comments. I found a great website the other day. http://www.mypetchicken.com. I like that they can tell the gender of the chick and send you just hens. Thanks, i’m going to get some new mottled java chicks soon. I am very passionate about perserving this rare breed. this will help ALOT, thank you.